The 12 volts 35 amp High Rate HRT Capacity SLA Sealed Lead Acid Rechargeable Maintenance Free battery AGM TM Technology , Terminal: Nut & Bolt L-2. Each battery carry the best technology and performance. Featuring high discharge design, wide operating temperature range, and long expected service life, Floating time range 3 to 5 years . Valve-Regulated Lead Acid (VRLA) Technology making them safe to operate in any position. SKU: KT-12350-HRT Series. 12v 35ah HRT Absorbet Glass Mat AMG battery comes with 1 Year Warrantee from Manufacturer; Featuring high discharge design wide operating temperature range and long expected service life; Floating time range 3 to 5 years. 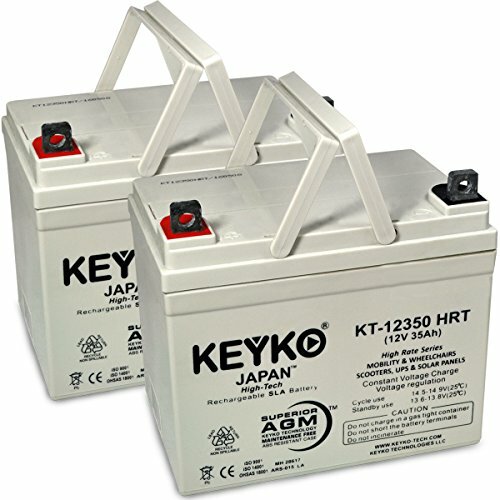 KEYKO KT-12350-HRT Series High Rate Deep Cycle replacement battery are safe to operate in any position (VRLA) manufactured with the highest standards to provide superior performance and long service life. Replace any brand and fit perfectly any device with this same capacity: CASIL CA12350 POWERSONIC PS-12350 UPG UB12350 12FM35 RHINO SLA35-12. Check all Product details and Product description below for more details.